… in fact that is what ERAKI Entertainment is trying to do with Caterina Valente​ ‘s legacy…. you can believe us when we say: it is quite a difficult task since it is continuously “butchered, panned, scanned and colorized” by a horde of know-it-alls! Singer/songwriter/producer Eric Van Aro’s Obsession EP is scheduled to be released on October 18, the latest in dozens of recordings Van Aro has released, many on his Switzerland-based record company, Eraki. Multi-skilled Eric Van Aro combines his impressive singing with his activities as a producer, as a European radio and television personality, and as the founder of his recording and production company, Eraki Entertainment. He came by his various skills via the gifts of his lineage, as the descendant of a family of musicians and artists reaching back eight generations. His mother is the great European singing star, Caterina Valente. His father, Erik Van Aro, Sr., is a German juggler and producer. Growing up with parents whose booking obligations took them all over the world, Van Aro was primarily raised in Switzerland and London. “My mother,” says Van Aro, “spoke Italian to me as a child. My father spoke German, and the nanny we had spoke French.” Add to that his exposure to English during the periods when the family was living in London. The net result was a cosmopolitan upbringing that prepared him – creatively, linguistically and personally – for his musical and artistic ambitions. By the early ’90s, Van Aro’s career had developed to the point where he was fully prepared to introduce himself to major European audiences via his self-conceived show, Freunde-Amici-Friends. A few years later, he was cast in the role of Captain Von Trapp in the Swiss production of the classic Rodgers & Hammerstein musical, The Sound of Music. Over the past two decades, numerous Van Aro recordings preceded Obsession. Their remarkable diversity reflected his fascination with a colorful range of styles and genres embracing jazz, pop, rock, house, lounge, rap, world music and more. Obsession, however, leans more in the direction of contemporary, jazz-tinged song. Reminiscent at times of Caterina Valente’s convincing mastery of jazz and Brazilian-driven music, it includes five tracks – “I’m Not Anyone,” “Since I Fell For You” “Rain” “Ordinary Fool” and “Obsession” — in which he is backed by the sole accompaniment of the brilliant Italian jazz pianist Fabio Gianni. The results showcase the multi-layered depths of Van Aro’s skills as an interpretive artist. With Gianni providing an irresistible rhythmic and harmonic foundation, Van Aro displays the full breadth of his musical story-telling ability to illuminate the essence of each of the songs in the Obsession program. “I’m Not Anyone,” by Paul Anka, was included because of Van Aro’s fascination with the Sammy Davis, Jr. version, ever since he heard Davis sing it on a TV special in the early ’70s. “Since I Fell For You” has been a hit since Annie Laurie’s version in the ’40s and, more recently, by George Benson. Once again, Van Aro uses his lyrically expressive skills to bring it vividly to life from his own unique perspective. “Rain,” written and recorded by Dr. John, is remembered by Van Aro for the lush string orchestration by Claus Ogerman. But this version, lacking the strings, nonetheless emerges as an equally captivating interpretation, blending Gianni’s superb backing with Van Aro’s intimate vocalizing. “Ordinary Fool,” from the 1976 musical gangster film, Bugsy Malone, was written by Paul Williams and recorded by Mel Torme. Van Aro’s version captures both the story-telling of the original as well as the jazz undercurrent of the Torme interpretation. And, once again, Gianni’s propulsive backing provides the exact essence of jazz vitality. “With You I’m Born Again.” David Shire’s 1980 song, recorded by Billy Preston and Syreeta, is performed by Van Aro in a gently floating duet version with country singer/songwriter Sheri Pedigo. “Obsession,” the title song of the album, composed by Brazilian singer/songwriter Dori Caymmi, revives the love of Brazilian music that has been present in Van Aro’s family since his mother, Caterina Valente, was one of the first artists to bring bossa nova to the U.S. and Europe. Eric Van Aro’s future in “this line of work” appears to be on a definite upswing with the release of Obsession. 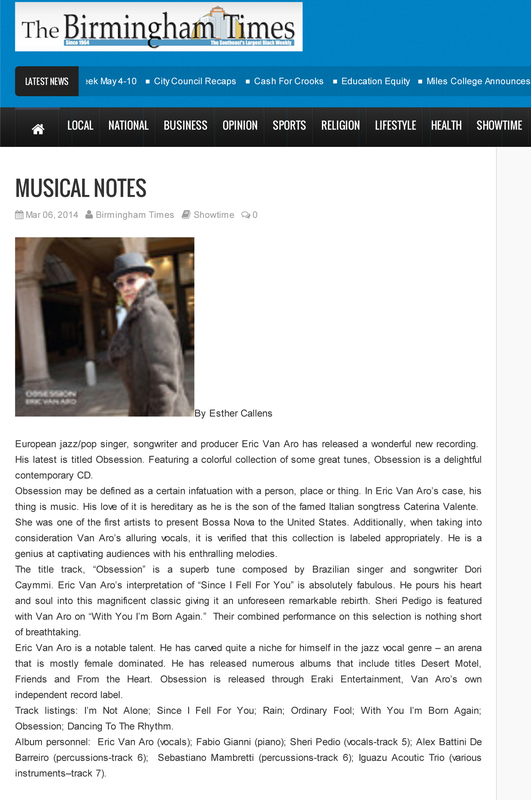 And what becomes eminently clear with every hearing of Van Aro in action – recorded and live – is that he is now entering a period of impressive musical authenticity with a strong jazz emphasis. At a time when young female singers have been dominating the jazz vocal category, Van Aro is displaying all the signs of emerging as a creatively significant male jazz singer. And, with the many successes of his mother, Caterina Valente’s career serving as a model for her talented son, the sky’s the limit for the Van Aro future.